This is a shortened versión of my doctoral thesis which examines cultural words in Latin and their translation into Old English. 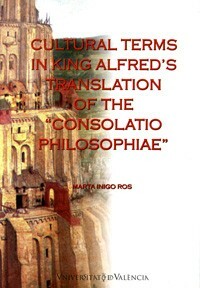 To this end, a definition and classification of cultural words is offered and applied to the study of King Alfred's translation of the 'Consolidatio Philosophiae'. Alfred's method of translation is explored in the light of the skopos theory and assessed in terms of adequacy to the socio-cultural and political context of 9th century Anglo-Saxon Wessex. Naturally, the initial format of the thesis has been made so as to facilitate reading for a more general public.